A look back at the premiere of Ashton's charming ballet which starred Lynn Seymour, Christopher Gable and two live pigeons with 'excellent manners'. The 2015/16 Royal Ballet Season will witness a major revival of Frederick Ashton’s charming work The Two Pigeons, last performed at the Royal Opera House in 1986. The story of the piece begins in 1961, when Ashton created Les Deux Pigeons for The Royal Ballet Touring Company (now Birmingham Royal Ballet), based on a fable by Jean de la Fontaine. His treatment was allegorical, his hero and heroine two young people whose love is put to the test, and his version of the ballet set in 19th-century Bohemian Paris in an artist’s studio. Ashton's model was the 1886 ballet Les Deux Pigeons, first performed at the Paris Opéra with music by André Messager and choreography by Louis Mérante. Messager revived the ballet at the Royal Opera House in 1906, when he was Artistic Director here, with new choreography by François Ambroisiny (who would in fact work with Ashton in 1928). For his own version, Ashton retained Messager’s score, in a simplified version arranged by John Lanchbery. The ballet had its world premiere on Valentine's Day 1961 under its French title Les Deux Pigeons, performed as part of the Royal Ballet Benevolent Fund Gala. 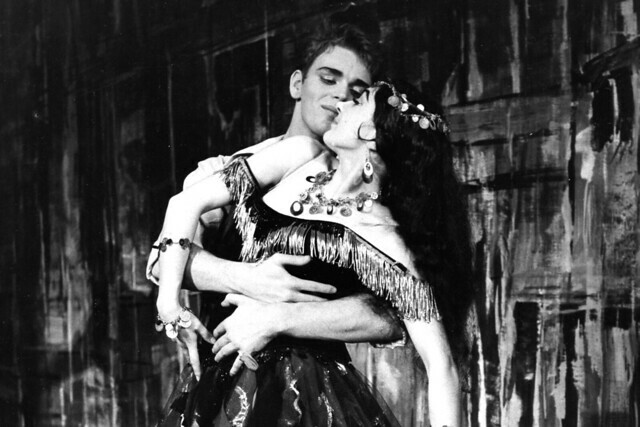 It was regarded as Ashton’s ‘Renaissance Ballet’ and featured new roles for three young artists: Lynn Seymour as Gourouli (later The Young Girl), Elizabeth Anderton as the Gipsy Girl and Donald Britton as Pepino (later The Young Man) – although Britton was replaced by Christopher Gable at the premiere, after sustaining an injury at the dress rehearsal. It was the first time Ashton had choreographed a role specifically for Seymour, who had recently triumphed in Kenneth MacMillan’s new ballet The Invitation. Real pigeons were featured on stage, and described by Birmingham Post as ‘a visual delight… and of excellent manners!’. The ballet was well received, although some critics felt that it did not compare favourably to Ashton’s recent La Fille mal gardée. Birmingham Post, writing about the 14 February performance, summed up the general response: ‘Ashton’s latest work is certain to be another popular success… Lynn Seymour as Gourouli, the gauche young girl who loses the artist lover temporarily to a gipsy, is enchanting. She is that rare creature, a dancer who can really get under the skin of a role. Elizabeth Anderton [the Gypsy Girl] danced with considerable élan, but it does seem unfair to have saddled her with such an overbearing jet black wig’. The New Daily also praised Christopher Gable, saying that he brought ‘ardour and virile strength’. Jacques Dupont, a well-known ballet and theatre designer in France, was responsible for the set and costumes. His work, according to Dancing Times, was ‘a continual delight to the eyes’. 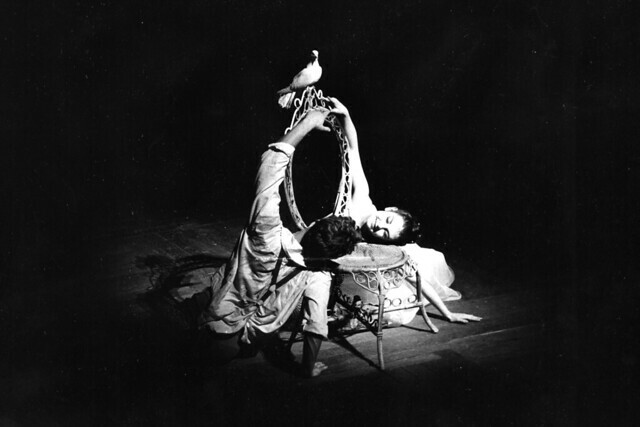 In 1962 a new production was created by Ashton for The Royal Ballet, this time entitled The Two Pigeons. Lynn Seymour, Alexander Grant and Georgina Parkinson were in the main roles and designs were again by Jacques Dupont. The ballet went on to establish itself as a firm favourite with audiences, giving subsequent casts the opportunity to excel in the leading roles. Rhapsody / The Two Pigeons runs 16–30 January 2016. Tickets are still available. The mixed programme will be broadcast live to cinemas around the world on 26 January 2016. Find your nearest cinema. The Two Pigeons is given with generous philanthropic support from the Fonteyn Circle. This article first appeared in the Royal Opera House Magazine, which is sent quarterly to the Friends of Covent Garden. Find out more about becoming a Friend. In my possession is a watercolour, presenting the ballet of The two pigeons on the 14th of february 1961. Do you, or anyone else, know whom it is made by? And if you have any contact with mrs. Lynn Seymour, would you be so kind to inform her about this watercolour? Perhaps she knows more about the provenance of this piece of art and likes to receive a copy of it. I think your watercolour might be by Keith Money, a very talented artist and a brilliant photographer with strong links to the Royal Ballet. He has published books about Fonteyn and Nureyev. If so, you're a lucky woman! It would lovely to find out the origin of this weather colour. What is the argument of this ballet?